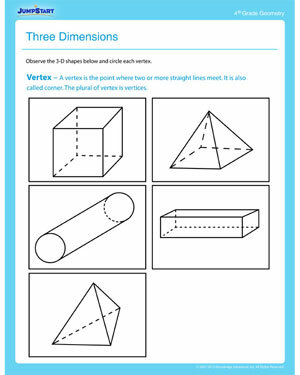 ‘Three Dimensions’ is a fun geometry worksheet for 4th grade. Here, fourth graders are introduced to the concept of ‘Vertex’ and asked to identify the vertices in five 3-D images. Using a pencil, kids will identify and circle each vortex on the images. Get this free, printable math worksheet to help your kids master fourth grade math in a fun way! Check out more of our free, printable fourth grade worksheets now!